The International Organization for Migration estimates that more than 1 million migrants arrived across Europe in 2015. The continuing refugee crisis is being met with hostility instead of compassion. 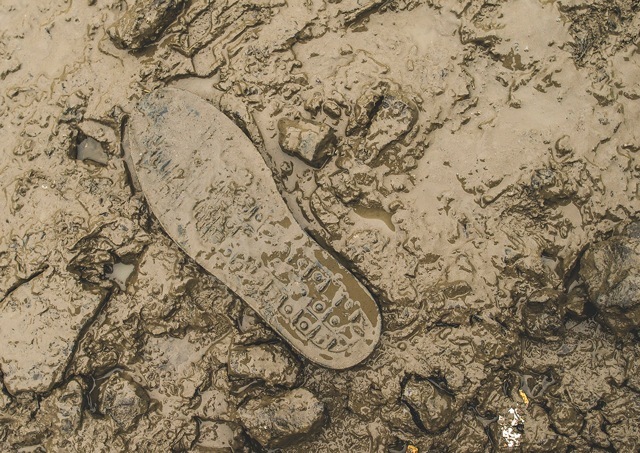 The footprint reminds us of the long and dangerous journeys they've undertaken in the hope of a new life. Painter Norman Lewis said, "The goal of the artist must be aesthetic development, and in a universal sense, to make in his own way some contribution to culture." Perhaps Nina Simone was paraphrasing him when she said, "It is an artist's duty to reflect the times." Migrants and refugees are dying on European shores and borders trying to escape the horrors of war. Unfortunately, nationalistic fervor has some blaming the economy and other woes on the refugee crisis. Enter Jeta B, a former European political public relations strategist turned photographer and storyteller. Jeta came to NYC from Brighton to follow her passion of photography. Her public relations skills complemented her photography to tell a story intimately. From her exhibits featuring Hurricane Sandy to urban youth with One Eye on the future, she captures humanity, weaving fragility and strength. When she returned to her beloved Brighton, she used her talents to highlight the refugee crisis. She started the #BeInTheirShoes campaign to gather shoe donations in Brighton and developed it into a photography campaign supporting efforts to bring unaccompanied minors in Calais who are eligible to safety in the UK. It is also a fundraising campaign for the Hummingbird project, where Jeta is a volunteer. Jeta has an eye for capturing the soul of her subjects. Maybe that is why her recent photo exhibition, BE IN THEIR SHOES is so moving. Jeta, along with other UK artists, teamed up with the Hummingbird Project to chronicle the condition of refugees living in camps in Northern France. Jeta's humble ask to #BeInTheirShoes is even more poignant because she was internally displaced herself during the Kosovo war, with friends and family in refugee camps. Unaccompanied minors, children and teenagers, who either lost their parents or traveled alone from war torn countries are being united with relatives in the UK after spending months in the Calais "Jungle." Life in the "jungle" for unaccompanied minors was precarious. There were allegations of unaccompanied minors being forced and lured into crime and prostitution for basic necessities like food, shelter, or a shower. Jeta's photograph, Only Footprints, beckons the reader to question one's own humanity looking at a lone shoe left embedded in the mud hoping the wearer survived and is safe. When we walk in the shoes of another, it is harder to be callous or indifferent to their plight. Jeta's photographs are being transformed by muralist Sinna One into graffiti art displayed throughout Brighton to challenge the anti-refugee sentiment as the UK welcomes unaccompanied minors from Calais.